Happy New Year to all of you! We hope you had a wonderful holiday season filled with lots of family and friends. Ours was filled with food, crafting, company and more food! If you have not had much time for yourself or time in your craft room, we thought we would re-cap December just for you. 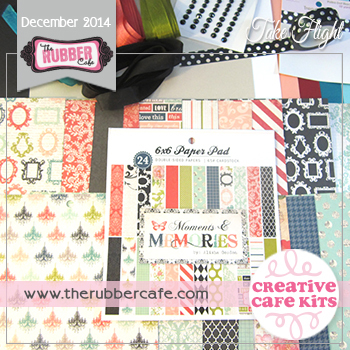 December's Creative Cafe Kit of the Month features unique stamps. They differ a bit from our usual stamps. This month they are filled with different patterns of micro dots, french toile and floral prints. They are beautiful stamped or embossed. The detail on these can not be matched. 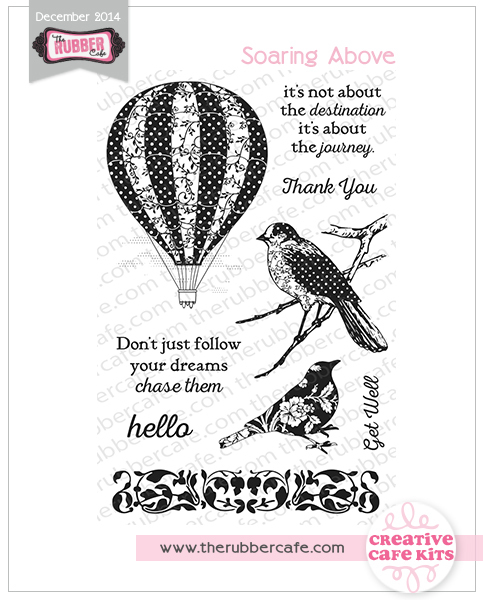 The stamp set "Soaring Above" is included in your kit along with beautiful papers from Carta Bella "Moments & Memories," gems from Queen & Co., and other coordinating embellies. 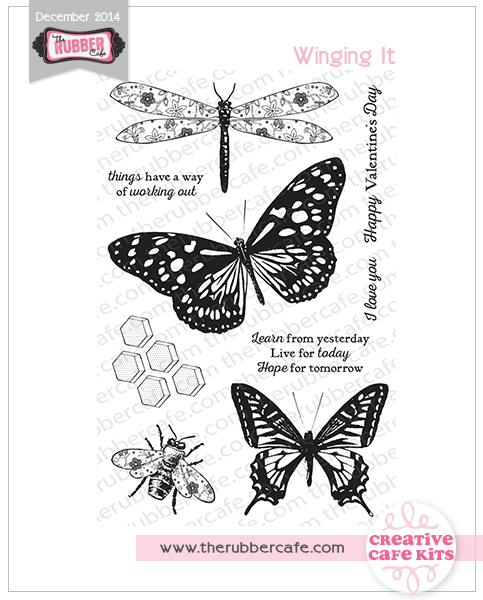 You can purchase "Winging It" as an add-on that completely compliments everything in this kit. Take a look. Want in on the fun? Go HERE to sign up. Did you know that each month, our design team member Debbie Seyer provides you with a video that shows you exactly what our Creative Cafe KOTM includes? For the sneak into December's KOTM "Take Flight" head HERE or click on the image below. Often times, our designers provide a glimpse on how they construct a card. This month, design team member Kristine Reynolds holds nothing back on this stunning "Butterfly Step Card." She gives you step by step instructions and dimensions on how you can replicate this beautiful design. Head over to the blog for instructions HERE. 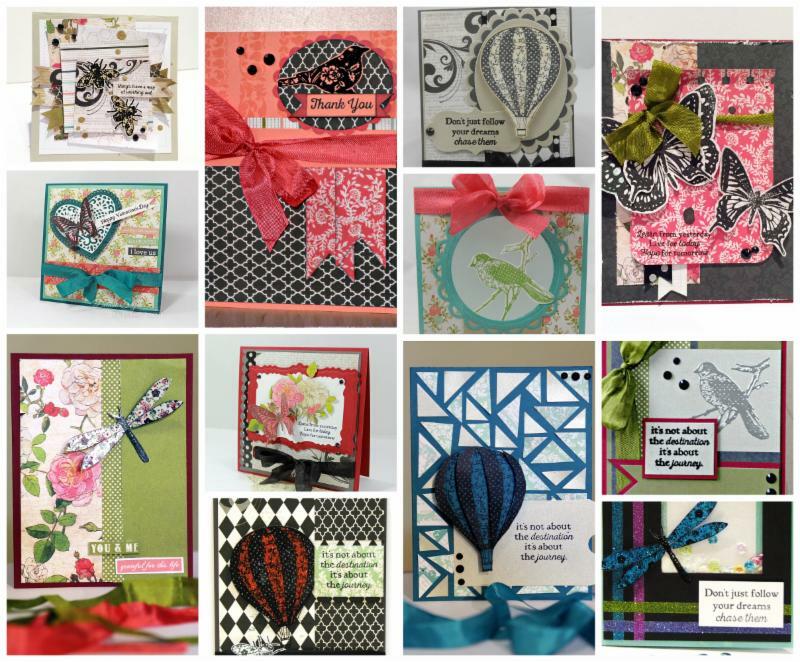 You can also see a video of Debbie Seyer's "Chase Your Dreams" card. 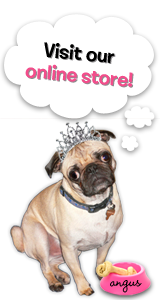 Go HERE or click on the image below. Our goal is to provide you with inspiration. Our design team receives the same kits you do. They create and then we share with you! Hoping to inspire you along the way. You can use the inspiration provided or follow along the tutorials and replicate what you see. Remember that handmade cards are the best! You can find more tutorials, videos, and step by step directions over on our blog. Click HERE. so we can see what you are creating. Maybe you could be the next fresh face! In this section, possibly the most important section of the entire email, is about our favorite foods. My favorite recipe, one of our designer's favorites, or something we found on Pinterest, from a friend or in a cookbook. Ok, so maybe I didn't need to make this photo quite so big. But come on people, you know they look delicious!!! 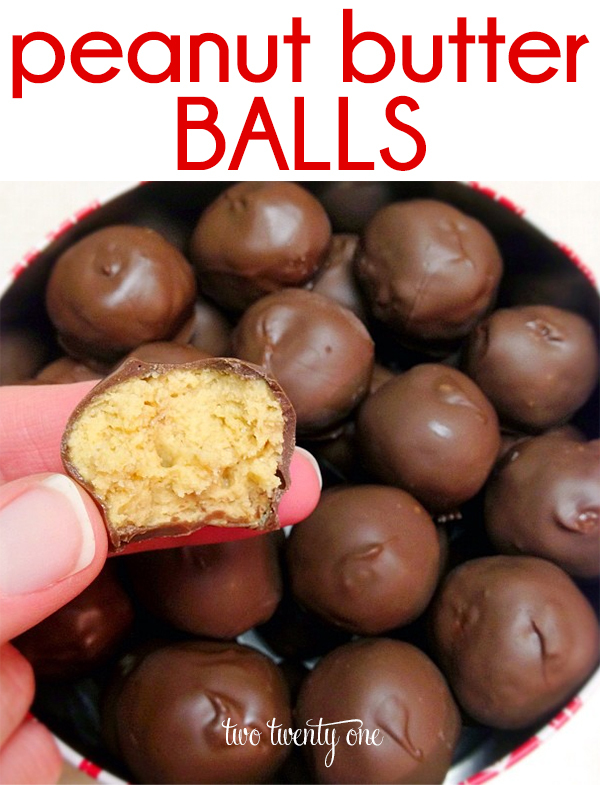 has a yearly tradition of making peanut butter balls with her son at Christmas time. She has tricked him into rolling, because its fun. Right? If you want to see more of our favorites, follow us on PINTEREST. I love seeing the re-cap. I may have to try that recipe!